Hi, I am interested in your 1964 Chevrolet El Camino (stock #5027-CHA) listed on Autotrader for $52,995. I'd like to get more information about this vehicle and confirm its availability. 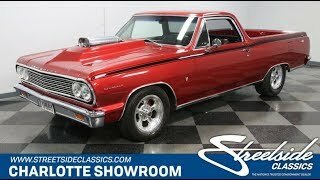 With a performance-built V8 peeking out of the hood, slick paint, a custom interior, and an overall award-winning presentation, this 1964 Chevrolet El Camino represents one of the most show-stopping and thoughtful builds youll ever see... and its up for grabs. This one instantly announces its something special the moment it comes into view. After all, the color that you love is Magnetic Red borrowed from a more modern Corvette. Plus, it has been upgraded with plenty of metallic element added to really make it radiate every time the sunshine hits the super-straight sheetmetal. Speaking of improving on the Corvettes good looks, this El Camino has a custom-crafted L88 big block hood, and one-ups the Corvettes aggression with a hood scoop boldly coming out of the top. Adding to this sporty appearance are more upgrades, like the polished Summit Pulsar wheels and the full-length black triple stripe that shows off this car/trucks unique profile. Theres a very good reason to show off this bodywork. This was the first year the El Camino was based on the now-legendary Chevelle body/chassis, and so this one celebrates the best parts of this marriage by drawing extra attention to the fundamentals. It includes mirror-like wraparound bumpers, an extra clean grille, and blue-dot quad headlights. Even the smugglers hatch on the bed is looking good with fresh carpeting. If you think the full attention to detail on this custom makes it ready for the car show, then youd be right. We have a long list of accolades this El Camino has already won. And the way this one continues to look, theres plenty of room in the truck bed to haul home more trophies. The interior is a terrific mix of comfort and speed. For example, the leather bucket seats keep you planted during performance driving, and theyve also got plenty of bolstering to be all-day comfortable. Not only do you have an armrest center console in-between these seats, but your seat also power adjusts to the ideal comfort position. Other great upgrades include an AM/FM/CD stereo with aux input for modern music players, cup holders, and ice-cold R134a air conditioning. Just like the exterior, this one has some thoughtful details. You see it in places like how the black and red theme is uniform throughout including on the lettering on the dash. When you turn on the turn signals, it plays a tune instead of the standard mechanical click. So once again, you can see how this build earns its awards. But more than just great comfort features, you know this is also a drivers machine. The sports steering wheel and professional-grade AutoMeter gauge upgrades (including large tach mounted in the center) let you know this is performance machine. Have you counted the gears on the shift ball yet? There have been so much time adding shining elements in the tidy engine bay that we dare you to find another piece that could polished. But more than just look terrific, theres a ton of substance behind this style. This is a special 355 cubic-inch V8 that has been fortified and enhanced with forged pistons (11.5:1 compression,) Mallory HyFire ignition, Pete Jackson gear drive, steel crank, Fink rods, GM 292 angle plug heads, roller cam/rockers, Edelbrock TRIYX Tunnel Ram intake, and topped with two Holley 650 CFM four-barrel carburetors. Headers add power while also giving a wicked sound to the dual exhaust. But more than just listen to this one; follow the path of the pipes in the undercarriage photos. There youll see more thoughtful details like the metallic red (proving the thoroughness of the restoration) and the cool checkboard driveshaft. Plus, youll also spot nice driving upgrades like the thick sway bar up front and boxed control arms in the rear. It all proves there was plenty of investment to make this build a great looker and a great driver. In fact, youll see that theme furthered by features like the Richmond five-speed manual transmission that gives you full control of the V8 power while also providing overdrive comfort. Even the progressive setup of the twin carbs allows you to choose mild or wild on demand. Add in quick ratio power steering, Wilwood front disc brakes, and BF Goodrich T/As, and you start to see how this is a great package for show and go. Complete with owners manual and restoration photos, youre looking at the El Camino we all want. So if youre quick enough, youll be the one who has it. Call now!